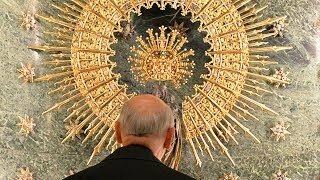 In this Eucharistic celebration for the repose of the soul of the Prelate of Opus Dei, the gospel reminds me of the naturalness with which Bishop Javier Echevarría strove to teach us to love Christ and our fellow men and women. No day went by in which he failed to comment on some passage from the Liturgy of the Word or from the other texts at Mass. He did so, of course, in meditations and spiritual talks, but also in the midst of the simplicity of daily life. Thus he would pause to pray and invite those around him to pray for a trip of the Pope, for peace in Syria, for the victims of natural disasters, for refugees, for the unemployed, for the sick (for whom he always had a special predilection that he learned from Saint Josemaria). On returning from a long trip, before coming home, he would sometimes stop at the hospital to visit someone who was sick. Everyone had a place in his heart. He had learned from the Founder of Opus Dei to “love the world passionately” because, as the saint said, “it is in the world that we meet God. 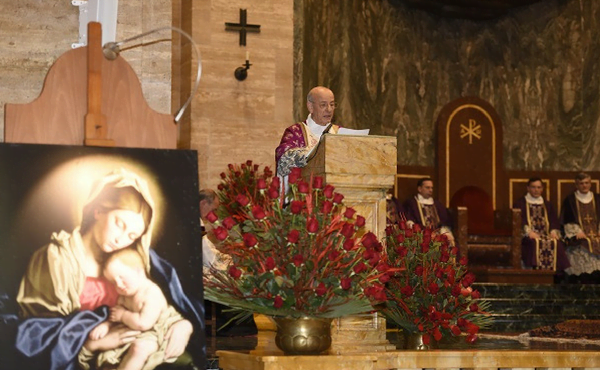 God shows Himself, He reveals Himself to us in the happenings and events of this world.” Bishop Echevarría loved real life, the events, the beautiful and true stories of God’s mercy. He faced a great challenge: being the successor of two saints, Saint Josemaria and Blessed Alvaro del Portillo. He was convinced he wasn’t up to the task. But at the same time he had the spiritual strength and courage to go forward, to never lose hope, since he was one of the “little ones” to whom our Lord had revealed the mystery of his love (cf. Mt 11:29). He came to know the love of Christ in his youth. First, in his family home. Then, with the great light brought into his life by his encounter with Saint Josemaria, he discovered more deeply the beauty of Christ’s love. He used to recall how, a few days after first meeting Saint Josemaria, he went with him and several others in a car. There he heard him sing a popular song about human love, which Saint Josemaria raised to the divine plane: Tengo un amor que me llena de alegría, y es este amor la ilusión de cada día. “I have a love that fills me with joy, a love that enkindles my heart with hope each day.” He understood that this love was God’s Love for us, and that the Holy Spirit infuses in our heart the love we need to love God and others. My yoke is easy, and my burden light (Mt 11:30), Jesus says, because his yoke is love. This is my commandment, that you love one another as I have loved you (Jn 15:12). Although Javier Echevarría was still very young when he was ordained a priest, the Mass became the center and root of his life, since the Eucharist is the “source and summit of all evangelization,” as the Second Vatican Council teaches. Over the course of more than sixty years, while putting on the chasuble to celebrate the holy mysteries, he liked to pray in his heart a prayer of the Church about the attractiveness of our Lord’s yoke, about the immensity of his charity and mercy, revealed in an exalted way in Jesus, who died on the Cross and rose for us. Following Saint Josemaria’s example and teachings, Javier Echevarría was a man with a big heart, able to forgive and ask for forgiveness. He was a great lover of the sacrament of Reconciliation and Penance, where we let Jesus enter our soul, and we experience “the full freedom of the love with which God enters into the life of every person,” as the Holy Father Francis writes. 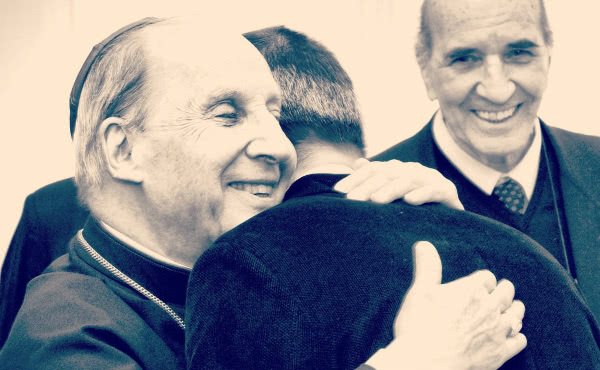 Bishop Echevarría, as vicar general of the Prelature, never had any other goal than that of assisting Blessed Alvaro del Portillo in his mission of guiding this small part of the People of God. Afterwards, upon being named Prelate by John Paul II, his most ardent concern and desire was to help those who had become his spiritual sons and daughters to truly seek the sanctity that God wants to give us; to spread around us God’s love, especially through the search for holiness in the work and activities of daily life: in the family, with friends, in society. Indeed, when he left us for heaven he was praying for the fidelity of everyone. I think we can discover the secret of all this in the reading from the gospel that we have just heard. It is prayer—faith in God’s loving presence—that makes us children of God in Christ through the Holy Spirit. I bless you, Father, Lord of heaven and of earth, for hiding these things from the learned and the clever and revealing them to little children (Mt 11:25). For sanctity is simply the fullness of charity in us. It is making the talents God gives us bear fruit, and getting out of ourselves to serve others; it is sharing in Christ’s life, that is, in the increase of our adoptive filiation in the one and eternal Son of the Father. We could say that Bishop Echevarría’s heart was filled with the impatient longing for the revelation of the children of God, which Saint Paul refers to in his Letter to the Romans (cf. Rom 8:19). I would like to thank the cardinals, archbishops and bishops, my brothers in the priesthood, the men and women religious, as well as the civil authorities, and so many other faithful who have wanted to unite themselves to our prayer for Bishop Echevarría and to give thanks with us for his life dedicated to the service of others. My dear brothers and sisters, all graces reach us through the mediation of Mary. The Father loved our Lady very much. Among the many shrines of our Lady he visited with Saint Josemaría and Blessed Alvaro, and afterwards as Prelate, was that of Our Lady of Guadalupe in Mexico. Providence has disposed that the Father was called to heaven on the 12th of December, feast of Our Lady of Guadalupe. That same day, when his life was slipping away, a priest asked him if he wanted a picture of Our Lady of Guadalupe placed close to him. The Father said no, since he could no longer see very well. But he added that he was very close to her in his heart. Let us place our prayer for Bishop Javier Echevarría in the hands of our Lady, spes nostra, our hope, while giving thanks to God for having given us this good and faithful shepherd. Vatican II, Presbyterorum Ordinis, no. 5. Francis, Apostolic letter Misericordia et Misera, no. 2.